Chefs David Akinin and Francisco Abenante were shocked when a mutual friend told them the child patients at the J.M. de Los Ríos hospital—the largest pediatric centre in Venezuela—were not being adequately fed. In June 2016 Akinin and Abenante went to the hospital, located in central Caracas, the country’s capital, to find out more. They were told that since the government had not paid the company that provided the food, it had cut off service. That day the menu was a small serving of grains and half a parboiled banana. The meal didn’t look appetizing. Due to their illnesses, not all of children could ingest what they were given. Abenante, who runs the kitchen at the renowned Caracas restaurant La Casa Bistró reacted immediately. “Something must be done; we cannot stand by with our arms folded. I have some chicken and vegetables in the fridge: why don’t we make soup for the kids?” he said. That same day they chopped vegetables — potatoes, cassava, pumpkin, ocumo, and yams — added chicken and a sofrito of leek, chives, sweet chili, onion, and garlic. When the broth was ready, they went to deliver it to the hospital. They saw the children eat, and the mothers smile. As they watched the scene, they felt they had to return. So the next day they came back with more soup. And the day after that. They have continued to do it daily for a year and a half. After that first day, Akinin and Abenante told other colleagues who voluntarily joined in the cause, bringing in ingredients and got involved in the preparation. At first, the group paid all expenses out of pocket. But they soon realized that it was necessary to make the initiative sustainable over time. They came up with the idea creating an association to facilitate fundraising. The Full Belly, Happy Heart Foundation was born. The team is made up of eight chefs: Carlos García, Eduardo Moreno, Julio González, María Elisa Römer, Elisa Bermúdez, Victor Moreno and Akinin and Abenante. 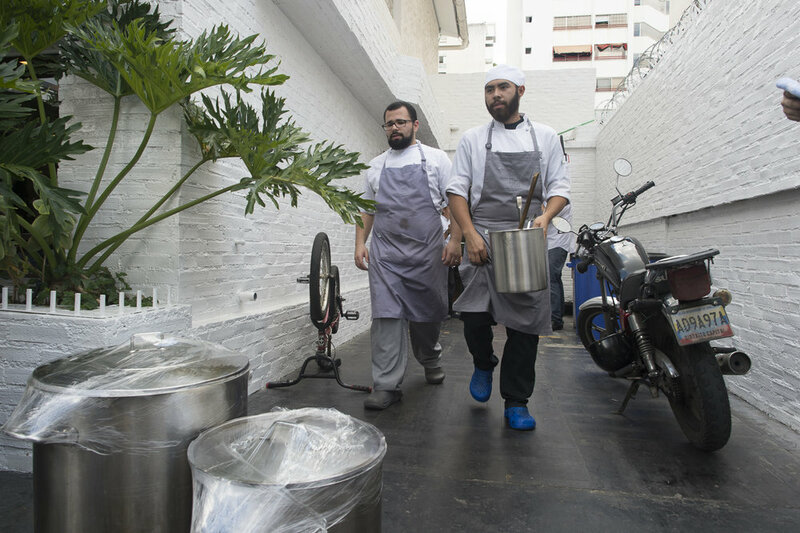 All are chefs at renowned restaurants such as Alto — the 32nd best restaurant in Latin America, according to the British magazine Restaurant. Each one is responsible for a different day of the week. They prepare the soup in the kitchens of their restaurants, following a recipe they designed together with a nutritionist. The group hasn’t considered varying the menu. Soup is an economical dish and simple to prepare. It is also easy to digest and has the necessary nutrients for people with different illnesses. For health reasons, the children’s sodium and caloric intake must be monitored carefully. As of September 2017, the Full Belly, Happy Heart Foundation has delivered more than 25,000 servings, an average of 220 daily. It offers them Monday to Sunday and has provided meals for the children, their mothers and the medical staff of the hospital. The foundation also takes meals three days a week to the Mother Teresa of Calcutta nursing home in the impoverished Mamera neighborhood, southwest of the city. The Full Belly Happy Heart Foundation is sustained through donations from private companies, individuals (many of them anonymous), and fundraising campaigns. The group still wants to feed more people, and hopes to start distributing food in schools. “Although at times they have been few, we have always had the ingredients to make the soup, thanks to donations,” said Abenante.